If you follow this site, you will know that we like our berries. The nutritious, antioxidant rich fruits pack a huge punch when it comes to your health. We have already written at length about the many health benefits of the blueberry, the acai berry, the bilberry and the rowan berry but how many of you are familiar with the maqui berry. If I tell you that this South American native has an antioxidant content greater than any food ever tested, I am sure it will pique your interest. There is a berry growing wild in the Patagonian region of Chile. A berry that grows so profusely that it is yet to be cultivated. A berry that is so high in antioxidants that it is already being referred to as the new superfruit. I am talking about the maqui berry, a berry that is still not very well known to most of us. We already know how good for you many types of berry are. 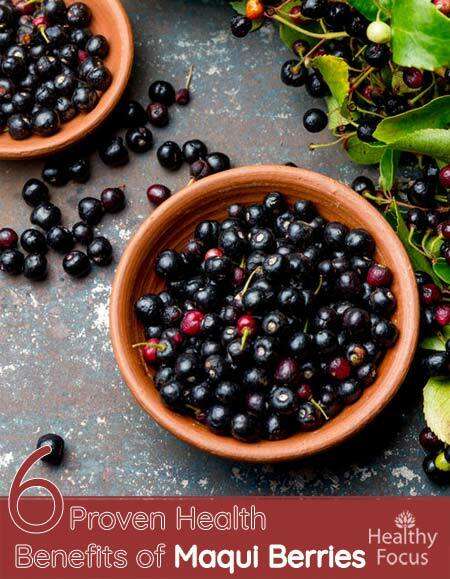 We are familiar with the antioxidant abilities of blueberries, elderberries, acai berries and many others but recent research has revealed that the maqui berry trumps them all. This deep purple berry is known scientifically as Aristotelia chilensis and has been harvested and enjoyed by the local people for many long years. Maqui berries grow wild and are widespread in the region growing on maqui bushes in fields, hillsides and forests. Because they grow so profusely in the region, the bulk of the commercially available maqui berries are harvested by the local Mapuche indians. They are already busy harvesting the berry for sale but business looks set to boom. These local people may have a difficult job keeping up with demand now that the secret is out and the berries are becoming more readily available to the wider public. We have long been aware that many types of wild berry are good for us and research has proven them to be very high in antioxidant activity. The forests of Europe and South America are teeming with berries but it is only recently that researchers have discovered that the forests of South America may possess even more antioxidant rich berries than we were previously aware of. Researchers have found that maqui berries contain very high levels of anthocyanins – pigments responsible for the purple color of plants like violas and delphiniums and certain other fruits. Anthocyanins have powerful antioxidant activity and a type of anthocyanin called delphinidins are found in unusually high levels in maqui berries. These compounds are known to have excellent natural anti-inflammatory properties meaning they can help treat nearly every form of chronic disease from heart disease and cancer to arthritis and diabetes. These antioxidants also help prevent cholesterol from being oxidized in the body which reduces the risk of heart disease like atherosclerosis, heart attack and stroke. Research published in Medical News Today reported that not only were maqui berries very high in antioxidants, they were in fact several times higher in antioxidants than acai berries (previously believed to be the most powerful natural antioxidant). On the ORAC scale used to measure the antioxidant value of food, maqui berries contained more anthocyanins than any other food researchers have ever tested. Research has consistently demonstrated that antioxidants like those found in maqui berries are beneficial to your heart. The anthocyanins present in very high levels in maqui berries can help prevent the oxidation of cholesterol. Cholesterol oxidation has been linked to a host of heart conditions and an increased risk of heart attack and stroke. Maqui berries may also exert an anti-diabetic effect. Researchers at Rutgers University found that an anthocyanin formula made from the maqui berries had a beneficial impact on glucose tolerance and blood sugar levels in obese mice with hyperglycemia. (2) Anthocyanins from maqui berries have also demonstrated the ability to increase glucose uptake in insulin sensitive muscle cells. Most everybody by now is aware of the important role that antioxidant play not just in terms of disease prevention but also their anti-aging abilities and their role in achieving healthier skin. Getting as many plant antioxidants into your system as you can help reduce the appearance of wrinkles and age blemishes and help you maintain your skin’s health for longer. They also help your skin to recover quicker after damage or illness. The authors concluded that maqui extract normalized H2O2 concentrations in people with moderate smoking habits. The results suggested that polyphenols in the diet could be a potential alternative to the management of certain respiratory disorders. One of the recent spate of studies done on the effects of maqui berries looked at how they could be used to help alleviate dry eyes. The Japanese study which was published in 2014 examined the effects of maqui berry extract over a 60-day period. Plenty has been written online about the weight loss benefits you can achieve from adding maqui berries to your diet. The fact that maqui berries are so nutritious and can help detox your system makes them ideal as part of a diet regime. Maqui berries help flush the toxins from your system meaning that your body will function more effectively overall. They can have a positive impact on your metabolism and digestion and help you to absorb food more effectively with less being stored as fat. They are certainly not a miracle fat busting cure. Simply eating maqui berries or taking a supplement is unlikely to have any real impact unless you incorporate them into a wider health regime that includes dieting and exercise. If you are interested in healthy foods, you will no doubt have seen the buzz surrounding acai berries. Until maqui berries were tested, acai berries were considered to have the highest antioxidant content of any food. These two super berries are both packed with antioxidants, nutrients, fiber and fatty acids. Both can lay claim to a variety of health benefits including immune support, anti-inflammatory and heart health benefits, anti-aging, preventing diabetes and even cancer. Both berries are native to South America. The acai berry grows on the acai trees native to the Amazon rain forest and the indigenous people have long been aware of the fruit’s many health benefits. These days acai berries are harvested and made into a fruity pulp. The pulp gets flash-frozen retaining its antioxidant content and nutritional benefits even after being shipped all over the world. The maqui berry is native to Chile and parts of Argentina where it grows on smallish evergreen trees. Like the acai berry, the locals have long known of the fruit’s many medicinal properties and benefits to their health. It is almost impossible to find fresh maqui berries outside of South America but a growing number of companies are producing supplementary powders and dried berries. Both berries are extremely high in antioxidants as well as important nutrients like vitamin A and vitamin C. Both berries also contain a number of essential minerals including iron, calcium and potassium. When it comes to fatty acid content, the acai and maqui berry are not the same. Both berries contain omega-6 and omega-9 fatty acids however only the acai berry contains omega-3. Omega-3 and -6 are healthy polyunsaturated fats which the body is unable to make itself. These fatty acids have excellent anti-inflammatory properties and help with blood clotting. They are also known to help reduce cholesterol levels and blood pressure which are risk factors in heart disease. As well as supporting heart health, omega fatty acids may also reduce the risk of diabetes, asthma, arthritis and cancer. While both acai berries and maqui berries are extremely high in antioxidants, the maqui berry comes out on top. Both berries contain an antioxidant compound called anthocyanin which is linked to a variety of health benefits. Antioxidants like anthocyanin work to neutralize or reverse damage done by harmful free radicals in the body. They can help fight disease and prevent premature signs of aging both internally and externally. Acai berries contain twice the amount of antioxidants as blueberries and around ten times more than grapes. While that is certainly impressive, when it comes to antioxidant content, the maqui berry has no equal. In tests conducted to date, the ORAC value of maqui berries is between 4 and 30 times greater than the acai berry. The fact that maqui berries are so incredibly rich in natural antioxidants gives them numerous health potential that we are only just beginning to appreciate and that we have only touched on in this article. They may help to ward off serious killer diseases like heart attacks and cancer. They can help you to detoxify, boost your immune system and improve metabolic function. They might even slow down the aging process and help you lose some of the excess flab. Unfortunately, maqui berries perish quickly after being picked so getting hold of the fresh fruit is difficult for the majority of the world. Maqui berries are however being used to produce a number of different types of supplement. Maqui berry extract is available in liquid, powder and tablet form. While tablets may be the most convenient option, the powdered extract is ideal for use in smoothies and juice recipes. Let us know if you have ever eaten maqui berries or if you have ever tried any of the supplements made from the fruit. Do you feel that they had the desired effect and would you recommend using maqui berries?